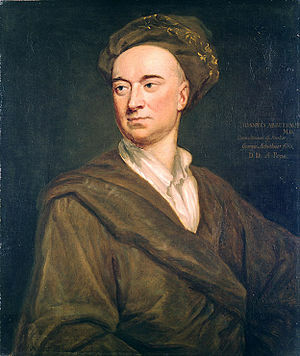 [follows the article on Alexander Pope] Amongst Pope's intimate friends were Dr. Arbuthnot, Dean Swift, and Gay. 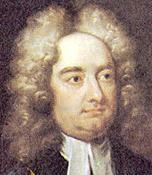 The first of these, best known as the joint author with Pope and Swift of Martinus Scriblerus, a satire on the useless pedantry prevalent in education and letters, and especially as the author of the History of John Bull (the original of that immortal personification of beef, beer, and prejudice), published his Essay Concerning Aliment, in which the vegetable diet is commended as a preventive or cure of certain diseases about the year 1730. Not the least meritorious of his works was an epitaph on the notorious Colonel Chatres - one of the few epitaphs which are attentive less to custom that to truth, and, we may add, in marked contrast with that typical one on his unhistorical contemporary Captain Blifil. "I told him" [the Master-Horse], says Gulliver," we fed on a thousand things which operated contrary to each other - that we eat when we are not hungry, and drink without the provocation of thirst . . . that it would be endless to give him a catalogue of all diseases incident to human bodies, for they could not be fewer than five or six hundred, spread over every limb and joint - in short, every part, external and intestine, having diseases appropriated to itself - to remedy which there was a sort of people bred up among us in the profession or pretence of curing the sick." "My master, continuing his dicourse, said there was nothing that rendered the Yahoos more odious than their undistinguishing appetite to devour everything that came in their way, whether herbs, roots, berries, the corrupted flesh of animals, or all mingled together; and that it was peculiar in their temper that they were fonder of what they could get by rapine or stealth at a greater distance than much better food provided for them at home. If their prey held out, they would eat till they were ready to burst." See Travels, &c. Part IV.